So, we’ve been a little Queen Esther-happy over here the past week. We’ve watched the movie every day (I’m not kidding) and talked about how brave she was. I am very happy with the letter Q! I told you we were going to make crowns for our Q verse but…well, it’s been a long week. My sil is in town from Mexico and hanging out with 5 family members you don’t see except once a year kinda takes your time up. 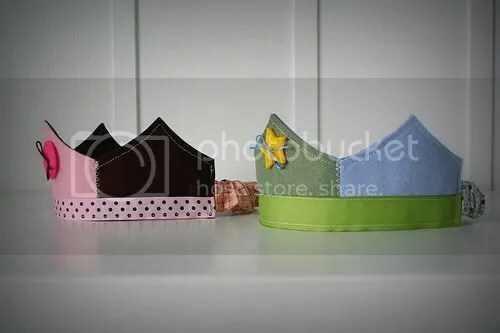 But I’m going to share with you the crowns I found online and hopefully by the end of the day, someone in this house will be wearing a crown! I love this one best. 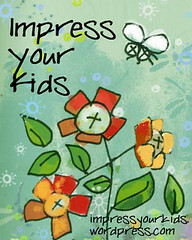 I found it at FamilyFun.com. It was made for 4th of July but if you switch the colors up, it’s a fun crown for boys or girls! I do think this one is a little hard for preschoolers (it’s made out of duct tape, straws & pipe cleaners). 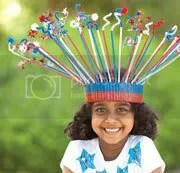 An easier version would be to use that corrugated paper trim (that you put on bulletin boards) as the headpiece. Then just stick the pipecleaners inside the holes of the corrugated paper. I found this via the blogger formerly known as Kerflop, on her blog Balancing Everything. She’s got a great tutorial. And of course, I know a 2 year old couldn’t really make this craft, but woweee, would they love to wear it or what?! Lay it sticky side up on the table. Place another length of contact paper on top of your sparkly stuff. This will create a little sandwich of sparkly stuff. Trim to desired shape and length. Place around child’s head and attach with…velcro, tape, glue, string, etc. I like this idea because of the clear & sparkly combo. Kind of a la Glenda, the Good Witch of the North. Do you have any good crown ideas to share? I’d love to hear!